Should we assume that everything Roseanne told us in the original series finale was made up? This post contains spoilers for the series premiere of ABC’s Roseanne reboot. Most devout fans prefer to pretend like the final season of Roseanne—in which the Conner family wins the lottery, and everything subsequently goes off the rails—never happened. The series finale, especially, has become infamous. In it, Roseanne reveals that the show we’ve been watching has actually been a fictionalized version of her “real” life, dropping bombshells including the biggest shocker of all: that Dan actually died in the hospital after his heart attack at Darlene’s wedding in Season 8. As ABC announced its decision to reboot its most iconic sitcom, many wondered exactly how the new series would square with this revelation, and Season 9 in general. They got their answer when the revival’s pilot ended up simply ignoring most of the original series finale—much like the first episode of the new Will & Grace, which faced a similar hurdle. Those who watched the new Roseanne closely, however, might have found themselves left with a few key questions. When Will & Grace returned to NBC, it used a similar maneuver--but in reverse. In the revival pilot, Karen Walker (Megan Mullally) told the group, "I had the craziest dream. . . Will was living with a swarthy man in uniform, and Grace was married to a Jew doctor.” When she found out both Will and Grace were childless and once again single, she breathed a sigh of relief, saying, "Nobody wants to see you two raise kids!" The new Roseanne pilot takes the opposite approach, defying the original finale to say that none of what viewers saw was actually a dream. Dan's resurrection is the most dramatic turn from the original series finale, but there’s another possible Roseanne retcons as well. 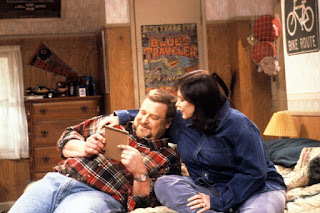 Episode 1 also reveals that Darlene has moved in with Roseanne after losing her job. She’s a single mom now, raising two kids—her teenaged daughter, Harris, who was born premature in Season 9, and her eight-year-old son, Mark. Which is interesting. We don’t learn the names of either Darlene or Becky’s husbands, though the show does indicate that Becky’s husband is dead. In the original series, Darlene was married to David Healy, and Becky was married to his older brother, Mark. Then, in the first finale, Roseanne revealed that in “reality,” Darlene was actually married to Mark, while Becky was married to David. (She switched their partners in her fictionalized version because, as Roseanne put it, “In my writing, I did what any good mother would do; I fixed it.”) Is there any chance that this detail carried over to the reboot, and that little Mark is the son of Mark Healy? This series has done enough weird stuff that such a husband swap would hardly be a total shock; remember that Patty Duke Show send-up involving the two Beckys? Then again, it would be ill-advised to toss aside the years of chemistry and nostalgia between David and Darlene—especially when Johnny Galecki is set to come back and reprise his role as David. Considering that Becky's husband is dead, this means David is almost certainly Darlene’s ex. Still, it’s worth asking why Darlene would name her son after Mark—a guy she was never crazy about, even if he was her husband’s brother. Has the show entered a reality in which Darlene and Mark get along?! Maybe; maybe not. After we learn the truth, all that’s left to find out is whether Jackie was actually a lesbian the whole time. 0 Response to "Roseanne: How the Revival Torpedoed the Show’s Divisive Finale—Sort Of"